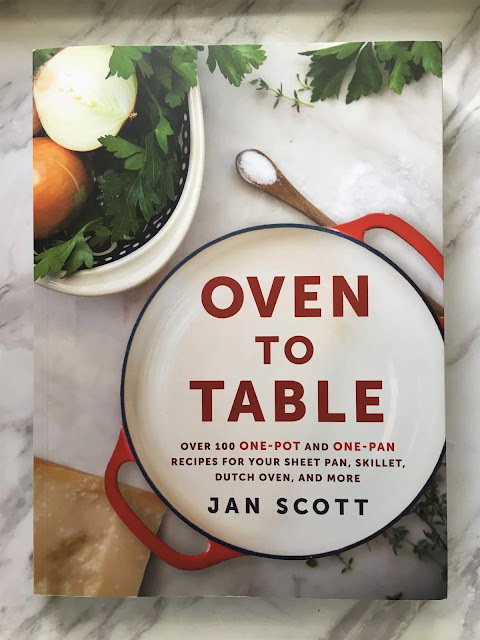 The release of Jan Scott's wonderful new cookbook Oven to Table came along at the right time in my hibernation. It's a gorgeous book filled with simple, yet flavour-forward recipes that make use of as few pots as possible. I like it when recipes are thoughtful when it comes to your washing up, especially for those of us who don't have dishwashers. If you're a fan of sheet pan suppers, cast iron skillet cooking, one-pot, one-pan meals, then this cookbook deserves a place in your collection. I've fallen for the Fudgy Raspberry Swirl Brownies and Rich Hot Chocolate. The Skillet Gnocchi with Bacon and Peas made my life complete. I mean, that combo of ingredients is everything. 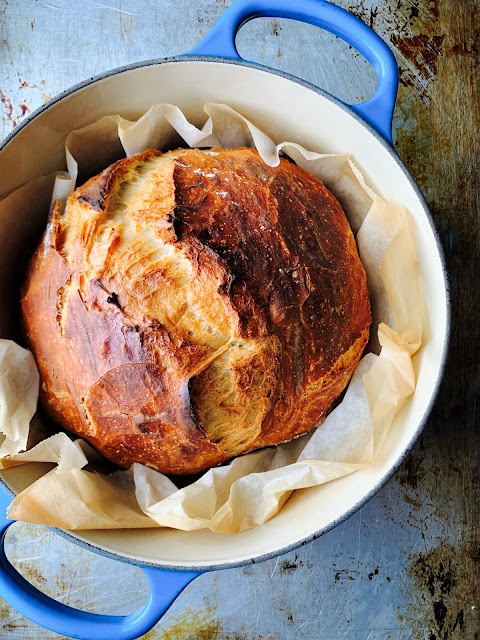 But it's the Overnight Faux Sourdough recipe that has been a game changer in my kitchen. Many of you may be acquainted with no-knead bread recipes, and this is similar, but different. I like that you just throw a bunch of ingredients in the mixer and let them come together into a soft dough. The use of plain Greek yogurt is super smart as it adds a slight tang to the dough. 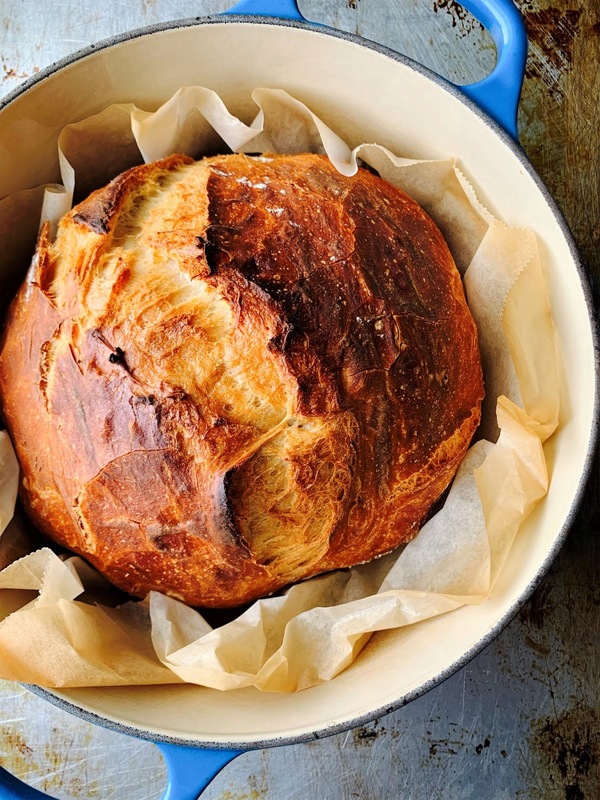 The rest of the time is involved with rising, resting and baking in a super hot Dutch oven. I've made this recipe a few times now and all were great successes. Yay, carbs! 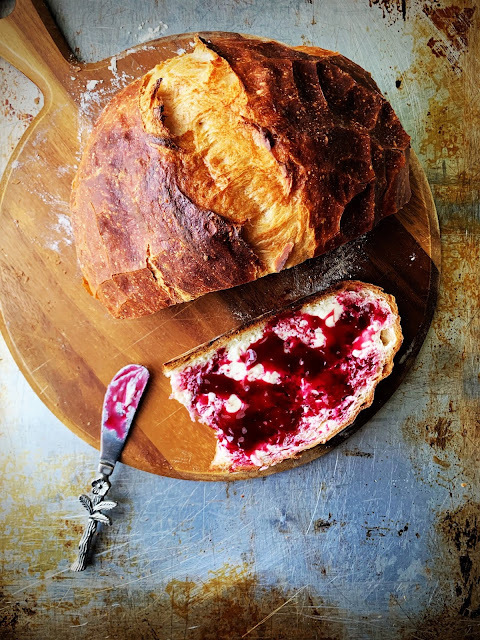 I love slathering a warm slice with salted butter and homemade jam. On some winter days, this is what brought me joy. I don't know about you, but whenever I make a beautiful loaf of bread I feel like a champ. Not that baking bread is difficult, but it just seems like more of an achievement than making a tasty muffin. 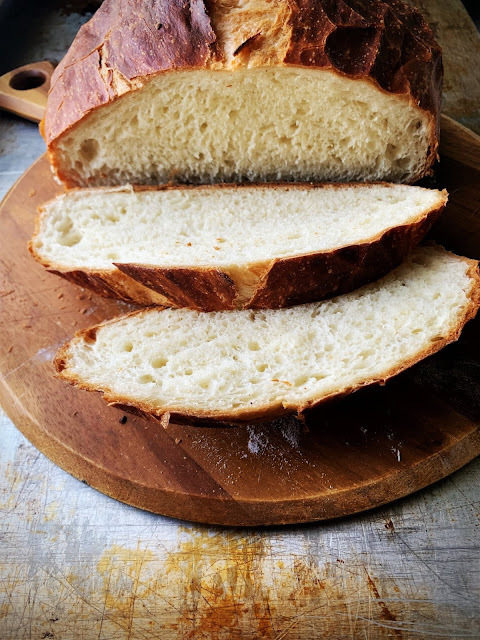 This loaf of bread would cost a pretty penny in fancy bakeries, but here in my little green kitchen, I shelled out maybe a dollar for ingredients. Baking from scratch is so worth it, and the amount of hands-on time required for this recipe is next to nothing. The amount of joy I felt once I lifted the lid and gazed upon my perfect loaf was priceless. I might have fist pumped the air. Maybe. If you've had a long, somewhat miserable winter too, you know how it is when you have to grab at the little things that will lift you out of a mood; the little things that will tell you it's all going to be okay. For most of my life these little things have been found in the kitchen - combining ingredients that when on their own are somewhat ordinary, but when all stirred together with attention and intention, are simply magical. Spring arrives this week and it can't come soon enough. High fives all around. We made it! Much love to Jan for allowing me to share the recipe from her brilliant cookbook, Oven to table. Go get yourselves a copy! 1. In the bowl of a stand mixer, combine the flour, salt, yeast, water, yogurt and honey. Using the paddle attachment, mix until the flour is completely incorporated. Alternatively, you can mix the dough with a wooden spoon until it comes together. The dough will be wet and sticky. Cover the bowl with plastic wrap and let sit at room temperature for 2 hours or until doubled in size. 2. Transfer the dough to the refrigerator and let it rest overnight or for 8 hours. 3. Lightly flour a work surface and, using a bench scraper or spatula, scrape the dough onto the floured surface. Sprinkle with a little more flour and fold the dough over itself a few times. Shape the dough into a ball and transfer to a piece of floured parchment paper, placing the dough seam-side down. Invert the bowl you used for proofing and place it over the ball of dough, allowing the dough to rise for 1 hour or until it doubles in size. 4. Half an hour before the dough is ready, place a covered medium Dutch oven(4-6 quarts) inside the oven and preheat to 450F. When the dough is ready, carefully remove the pot from the oven and, using the parchment paper, lift the ball of dough into the hot pot. Tuck the parchment paper into the pot and, using a sharp knife, cut a deep slit into the middle of the ball of dough. 4. Cover the pot and bake for 30 minutes. Remove the lid and bake for another 15-25 minutes, or until the bread is crusty and golden brown on top. Remove the pot from the oven and let cool in the pot for at least 30 minutes before slicing. 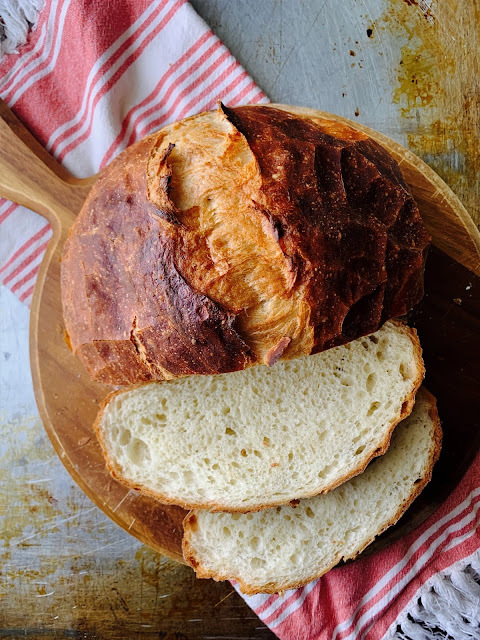 Makes 1 boule, serves 4-6. Or one, if you're like me. Recipe from Oven to Table, by Jan Scott (Penguin Random House, 2019). * I didn't have instant dry yeast in the house, so used 1 tsp of active dry yeast. All was well! Just be sure your yeast has not expired!